Google announced two changes or "enhancements" made to the Merchant Center data feeds that Google says "improves efficiencies for large retailers" and "helps small retailers get on board more easily." Online product inventory feeds: a new feed type that lets you quickly update price, availability and sale price of your key products. This is especially useful for larger retailers that need to change these attributes frequently. Submit new information for price and availability throughout the day to update these specific attributes. You can submit updates for just a small subset of your products for faster processing. If there’s an error processing your online inventory feed, your full product feed will not be impacted. Google Sheets add-on: a Sheets extension that connects your spreadsheet directly to Merchant Center for a faster and easier upload. This is especially useful to for smaller retailers looking to get up and running quickly with shopping ads. This allows for you to validate your products directly from Sheets. 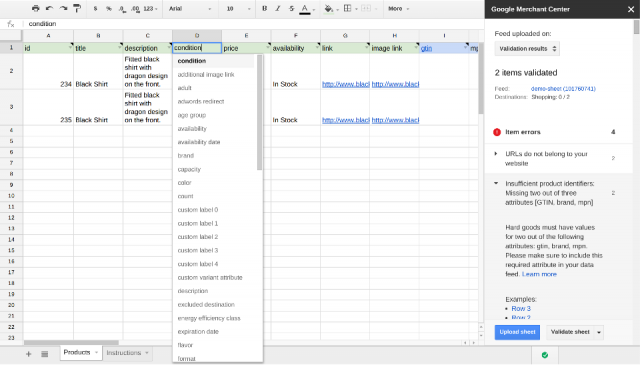 The sidebar in the add-on allows you to validate individual rows or your entire Google Sheet, showing you any errors and warnings before you upload your data feed. You can also upload your products directly from Sheets. From the sidebar, you can upload your entire spreadsheet into Merchant Center, without leaving Sheets. The results of your upload are displayed directly in the sidebar, giving you immediate feedback on feed processing.